Our business, Celestial Dawning, LLC is going through a transformation. We had to close our doors back in May 2016; however, it was not permanent. 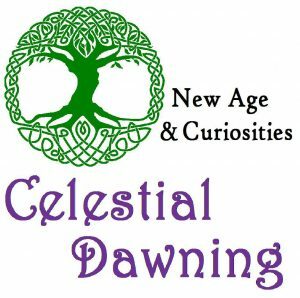 The transformation of Celestial Dawning is that it will not focus on New Age and Metaphysical retail items, but rather it will become an aura photography studio and a center for holistic “well-being.” Celestial Dawning will be focusing on dynamic phytotherapies, herbal therapies, various forms of aromatherapy, gemstone therapy, and energy work through Reiki. Any items that will be sold will pertain to the services that are offered. The main focus will be the aura photography studio. An aura is the electromagnetic energy field that surrounds, encompasses, and permeates the body as well as all living things. The colors and patterns within the energy field makes up a blueprint of who we are as a living and energetic being. 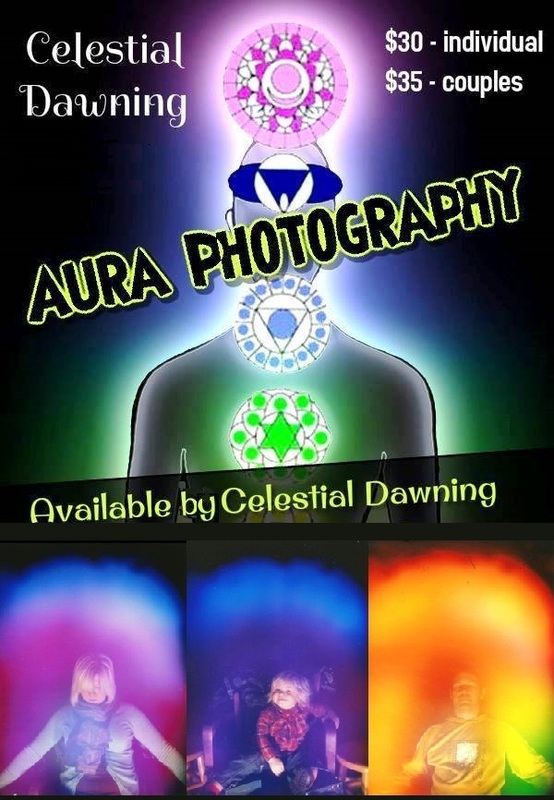 For those who do not know what aura photography is, it is a visual image of how we are functioning energetically (emotionally, physically, mentally, spiritually, etc.). So in simpler terms, the aura is the “life force” that every living thing possesses and the photography part is the practice of capturing that energy on film through a biofeedback system. The biofeedback system provides feedback of energy displaying through various shades of colors – with each color representing a different meaning. For more information on aura photography, look up Semyon Kirlian who developed Kirlian photography, which is the base of aura photography. 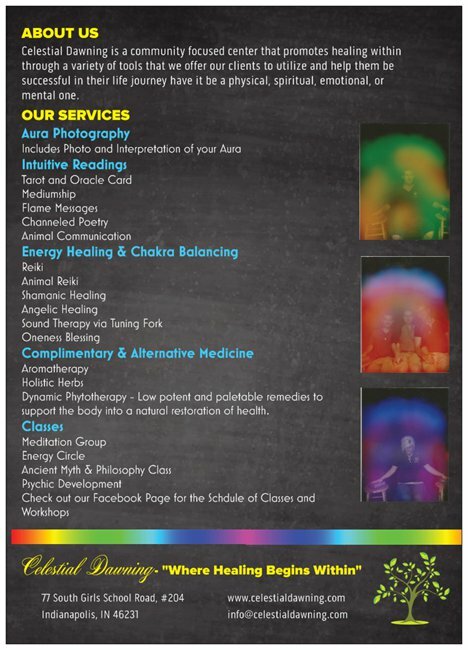 Aura photography to me is much more than just a novelty service that can be found at certain new age shops. In fact with my studies, I’m learning that my “gut feeling” is correct that the use of aura photography could someday be used as an additional diagnostic tool that could help physicians determine/locate areas of “sickness” in the human body. 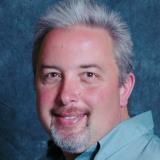 This technology will help providers gain deep insight into the internal state of their clients’ well-being. Using this cutting-edge technology will gain credibility and is sought after by many physicians, practitioners and clinics all over the world. With the new trends in holistic approaches, these systems offers diverse ways to treating health issues and validating finds. This equipment enables practitioners to store results and monitor the progress made by individual clients. Over time, a patient can see what blocked areas are clearing and how mental states, energy levels, and overall well-being is benefited. Please keep your eyes open for more updates on Celestial Dawning’s new location. Not much longer! Blessings to you all! DON’T MISS! 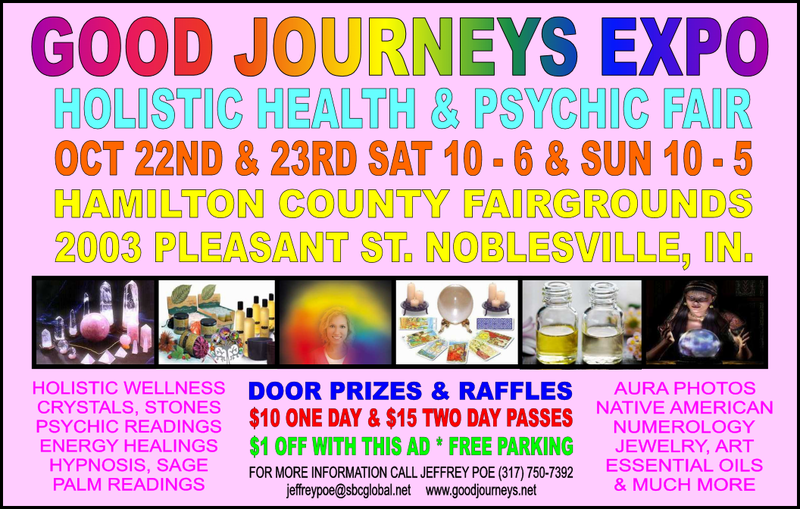 Aura Photos & various items at the Good Journeys Expo at the Hamilton County Fairgrounds in Noblesville. This Oct 22nd & 23rd! 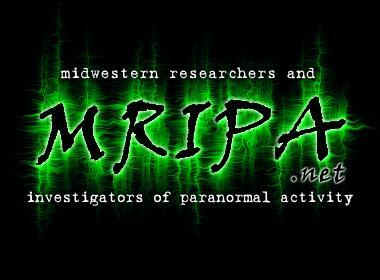 Celestial Dawning will be at the Hannah House, for the 10th Annual Paranormal Meet & Greet on Aug 13th! 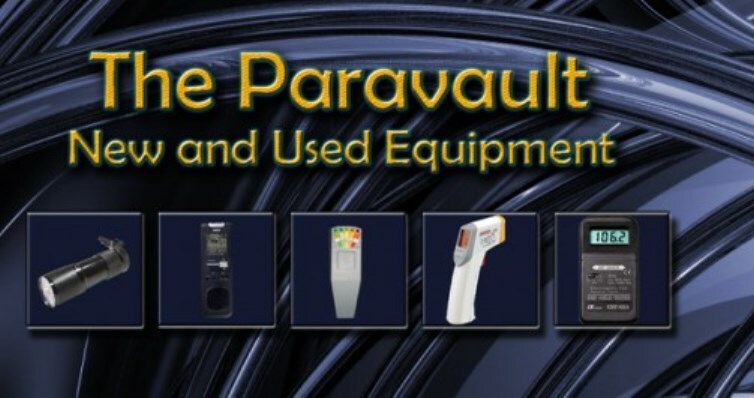 Come get an Aura Photo w/ interpretation from the radiant Rachel Weinrich, see our ParaVault new & used paranormal investigation equipment, +other items for sale! New Online Store Finally UP and running! The online store is functional we are now trying to load more items! Please click the link below, or click the graphic to go to the new web-store! Please bare with us, as we try to get some of our items uploaded. We have so many unique, one-of-a-kind items in our store, that it is difficult to list them online. 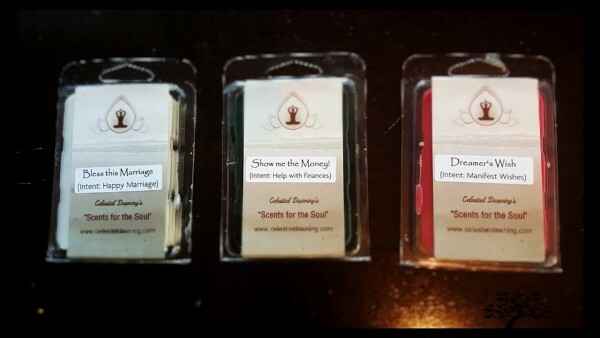 Currently our shipping abilities are set to a Flat Rate Shipping fee of $10, so please be aware of that for small purchases..
CD’s new Scents for the Soul, soy wax melts! 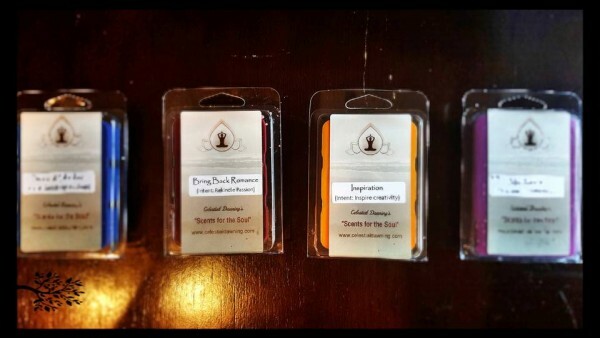 Our first batch of “Scents for the Soul” are done! This is not even half of the intent options that will eventually be available to our customers! 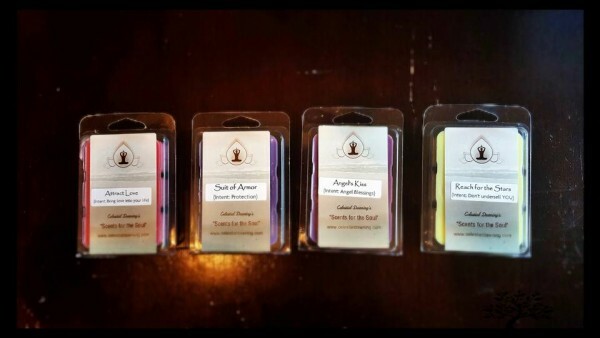 All wax melts are made of soy wax and are clean burning meaning no smoke or residue during/after melting. Cost per block is $7.99.